Raynham Hall is one of Britain’s fine country houses and is the traditional seat of the Townshend family. Much of the building’s design is attributed to the famous architect Inigo Jones and, today, design connoisseurs greatly appreciate its stately grandeur. 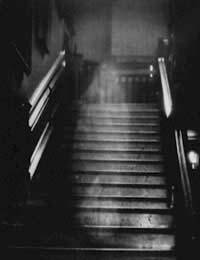 It is better known for another reason, however – its resident ghost, known as the Brown Lady of Raynham Hall. The ghost is believed to be that of Lady Dorothy Townshend, sister of Sir Robert Walpole, generally regarded as Britain’s first Prime Minister, and the first to occupy 10 Downing Street. Dorothy and Lord Charles Townshend fell in love while young and hoped to get married. Dorothy’s father denied permission for them to do so, however. Charles married another woman instead but, some years later, after his wife had died, Dorothy and Charles were able to fulfil their earlier dreams and begin a new marriage together. They lived happily together for a time, and had several children. Some years later, however, Charles was shocked to hear rumours that his wife had had a fling with Lord Wharton, a notorious rake, during the time of his first marriage. So angered was he by this that he ordered his wife confined to her apartments within the house, and denied contact with her children. Dorothy died at the abnormally young age of 40, some said of smallpox, some of a broken heart and some of murder! Even after death, however, Dorothy did not leave the scene of her torment. She has since been spotted several times in ghostly form, wearing a characteristic brown brocade dress, earning herself the name “The Brown Lady.” George IV himself, while still Prince Regent, saw the ghost while staying at Raynham Hall. Some bolder types have even asked to stay in Dorothy’s old room, in hope of seeing her ghost. At least one man, the novelist Frederick Marryat, who did so got a little more than he bargained for. He did not see the ghost in his room but, later, while walking through the corridor with two others, all three saw the ghost of the “Brown Lady” striding towards them, looking at them in what they described as a “diabolical manner.” Frightened, one fired his pistol at the ghost. The bullet was found embedded in the wall the next day. Dorothy’s portrait hangs on the walls of one room and the eye-witnesses have often commented on the striking resemblance of the ghost to the person in the portrait – so there is little doubt about the spirit’s identity. But eyewitness reports are not the only evidence of the ghost’s existence. It was in 1936, while on assignment for Country Life magazine, that two photographers, Captain Provand and Indre Shira, visited Raynham Hall and took what was destined to become perhaps the most famous ghost photograph of all time. The two had been taking a picture of one of the building’s staircases when Chopra shouted that he saw something strange, and urged the other to take a photograph quick. Provand was still under the black cloth, which was used in those old-style cameras, so he saw nothing with his own eyes. He also saw nothing through the camera’s viewfinder but obliged the other man by taking a picture as requested. When it was developed it showed a radiant, feminine figure standing on the stairs. Detail is hard to make out in the haze of light but the men immediately pronounced it a photograph of the famous Brown Lady. The photograph was published around the world and an account of the incident appeared in the magazine. Paranormal investigators who interviewed the two men while they were alive were uniformly impressed by their sincerity. A signed statement was obtained from the man who had developed the photograph, affirming that this was how it had appeared in its original form. Various photographic experts have pronounced opinions on the famous photograph over the years. The vast majority see no sign of fakery in it, but at least one has claimed that the apparent “ghost image” may have been the result of a double exposure. Reproductions of the photograph are easy to find on the internet, so why not track one down and decide for yourself? Interestingly, the Brown Lady is not the only ghost to appear at Raynham Hall. Quite a few other ghosts, including that of a dog, have been seen there! Nor does Dorothy Walpole haunt it exclusively. She has also been known to appear, in a younger, happier guise, at Houghton Hall, and at Sandringham House. Perhaps she’s making up for all that time she spent locked in her room!